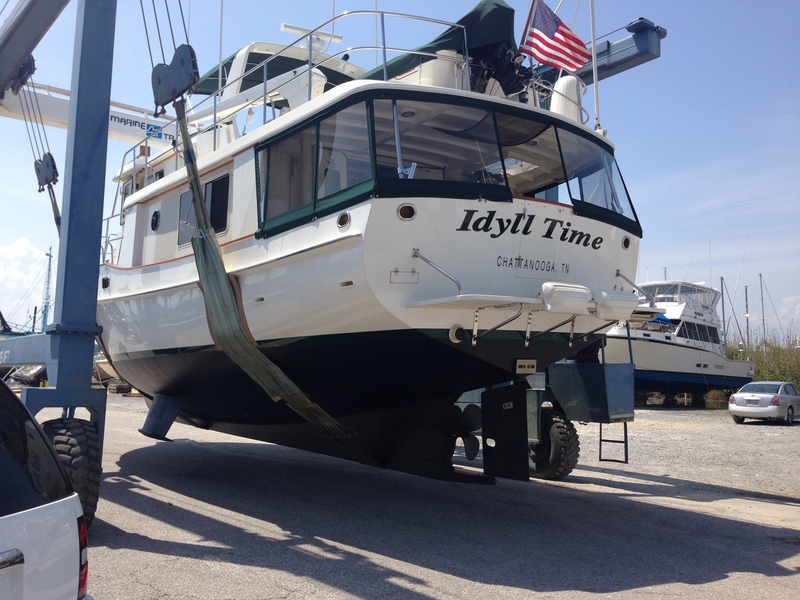 There is a knot in my stomach as the lifting straps groan with the strain of Idyll Time’s 65,000 pounds of bulk as she is hoisted out of the water. 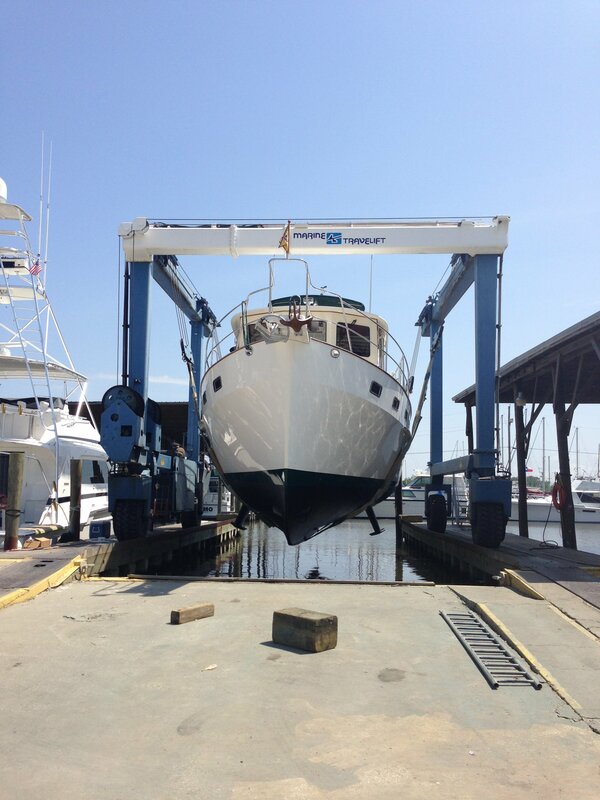 All eyes are fixed on the boat as she is lifted high in the air and onto hard pavement. Although we have had this done many times now, it is still nerve wracking each time we have her hauled. George, the lift operator, is very experienced and does a great job of getting her safely placed in the gravel paint yard. 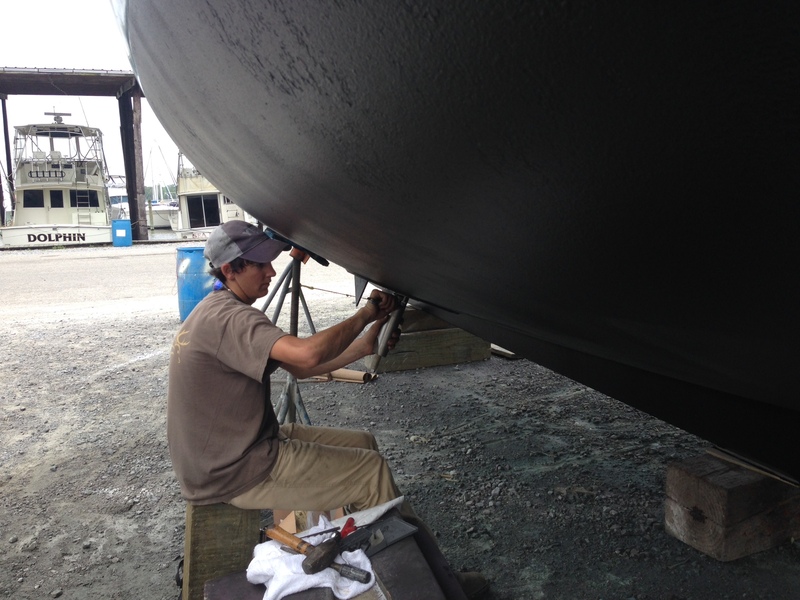 After a quick pressure wash, the jack stands are secured under her hull to keep her upright for the next week. Once she is stable, we are allowed back aboard. We will boat camp here in the parking lot for the next week. We do have power and can use the boat shower. The only thing missing is the A/C as our Cruise Air’s require water for cooling. Boat camping does have its drawbacks. Getting on and off is a little challenging, especially with Sebastian, as we must climb up a ladder placed at our stern each time. The bottom paint crew first give the hull a soda wash to kill any biological slim. This is followed by a thorough sand blasting of all metal parts below the water line such as rudder, propeller, and scoop covers. 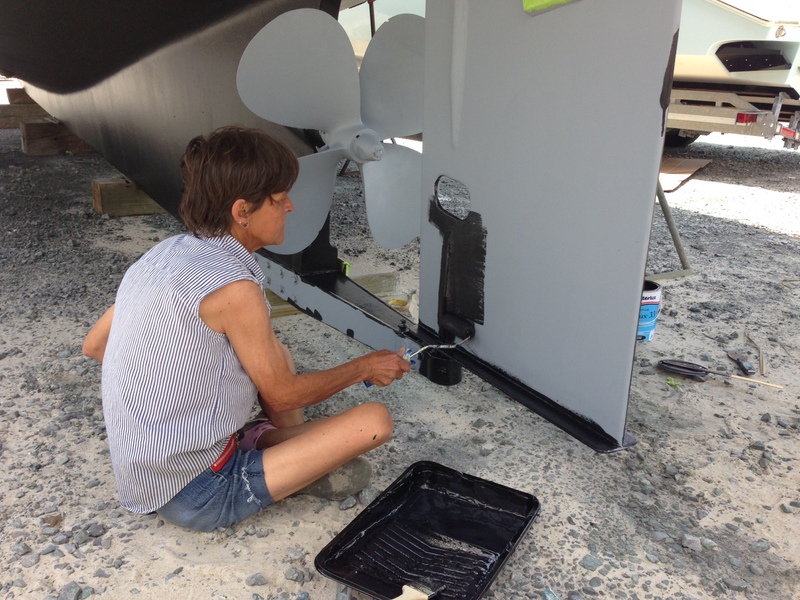 Over the next few days two coats of black bottom paint are applied to the hull. All of the running gear and metal parts get two coats of anti corrosive paint. This is the best paint job that IT has ever had. 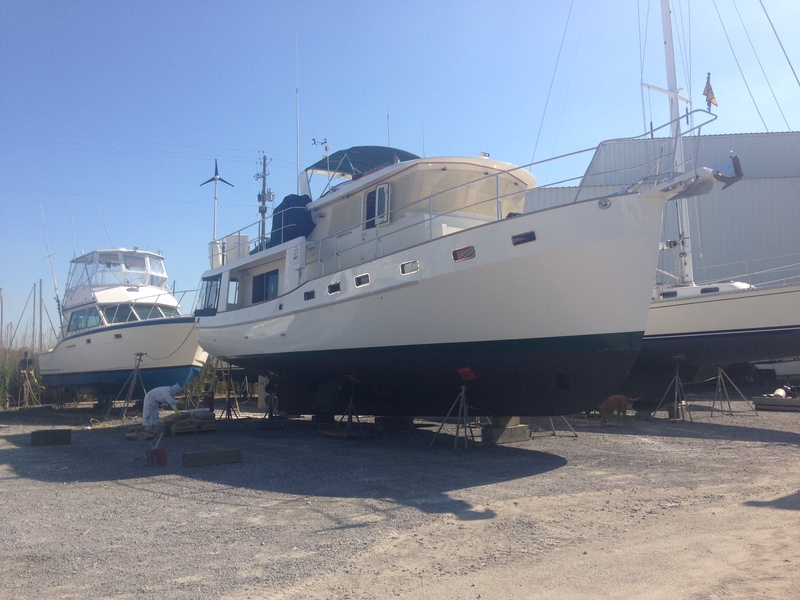 Our next project is to replace the seals on both the bow thrusters and hydraulic stabilizers. Although they are working fine, the manufacturer recommends that the seals be replaced every six years. Being eight years old, we are past due for this service. One of the reasons for selecting Dog River for our haul out is that they have been factory trained by ABT/TRAC, the bow thruster/stabilizer manufacture, for working on these systems. 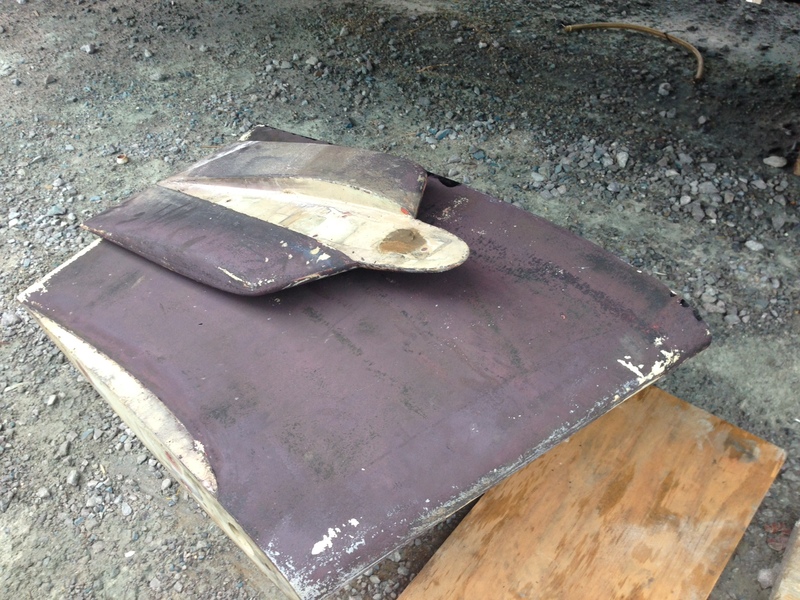 Once the seals have been replaced, our stabilizer fins are reattached to the hull. After two coats of paint to the fins, IT is now ready to be put back in the water. 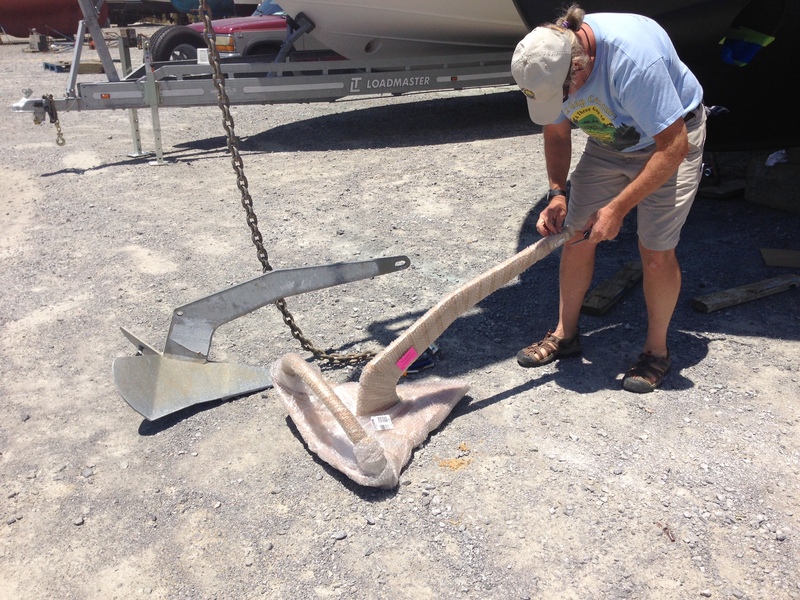 While out of the water, we decided to change out one of IT’s anchors. Over the years, we have discovered that our 88 lb. delta anchor does not always hold. Our smaller 66 lb. Bruce anchor is our go to choice. It has always held even in the hardest of blows. We replace our Delta with an 88 lb. Rocna anchor. This anchor has gotten excellent ratings from the boating community. We were very happy to discover that it fit in the same slot as the Delta without any modifications. We will continue to use the Bruce but it is comforting to know we have the Rocna for heavy duty weather. One other boat project while here was to rebuild our John Deere water pump. Jeff started noticing a few drops of water leaking from the bottom of the pump. We decided to go ahead and replace the seals before any major problems. At the same time, we ordered a new pump which we will store as a back up. Our haul out took much longer than anticipated due to weather and marina backlog. We had planned on being out of the water for 5 days but ended up out for two weeks. We feel much better once IT is again afloat. 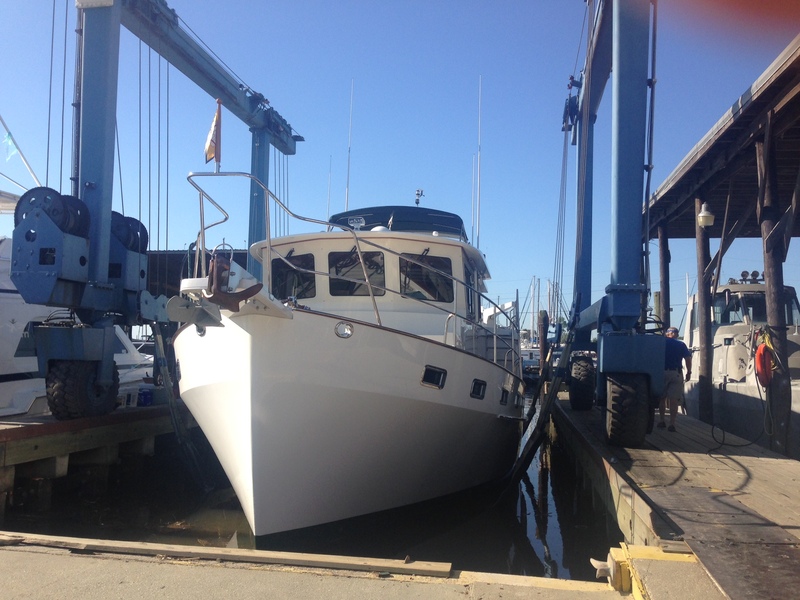 Next is a sea trial with the mechanic to make sure the stabilizers are working properly. After a slight adjustment of the position sensors, the system is good to go. IT is whole once again and ready for new adventures. This entry was posted on May 30, 2014 at 5:42 pm. You can follow any responses to this entry through the RSS 2.0 feed. You can leave a response, or trackback from your own site. 1 Response to "The Haul Out"
It never ceases to amaze me just how large Idyll Time is!!! Haven’t seen her in Grand Haven for a couple years! Julie and I are boatless at the moment (by choice) as we search for that “fast trawler” style Looper. We are continuing to work our plan and will always treasure your thoughts and advice from a few years back. Fair skies and following seas to you Jeff and Susie.